Sometimes extraction is the only viable treatment route. X-rays will be used to assess the tooth and reveal any potential complications. We understand that extractions can cause nervousness in patients. Our vast experience in routine and complex extractions means we strive to make you feel as comfortable and as pain free as possible and ensure the issue is treated efficiently and effectively. The option of sedation will be made available to you. At the same appointment of a tooth extraction, it is possible to place grafting material(s) to maintain the bone and tissue volume in the extraction site. This is particularly important if you are considering a dental implant in the future. See the video below for further details. Orthodontic extractions are also carried out at the clinic. Wisdom teeth are the final molars to erupt in adulthood. In some cases wisdom can erupt with no or little problems. It is even possible for wisdom teeth to lay undisturbed. However they may become impacted (trapped under bone, on their side or not fit to the opposing tooth), this may cause pain, swelling and infection. An x-ray can identify the reason for the wisdom tooth pain so that the best form of removal is identified. We are experienced at extracting all types of wisdom teeth and the problems they may throw at us. 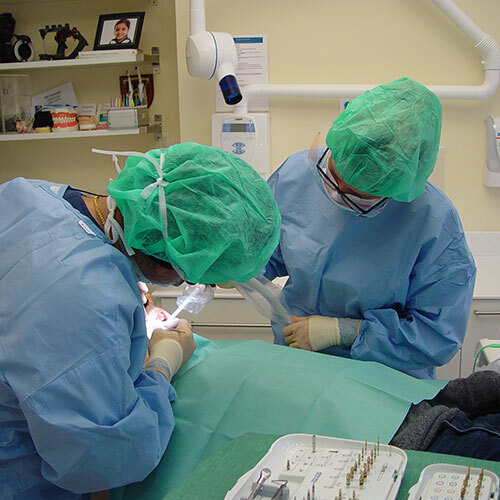 If a surgical procedure is required for removal, or you are a nervous patient, sedation options are available to you. Wargrave Dental Clinic are able to offer sedation to nervous patients. This takes the form of oral – a tablet taken on your arrival – or intravenous sedation that is administered by a visiting anaesthetist from Sedation Solutions LLP. Sedation Solutions LLP is a CQC registered leading provider of sedation for the dental and medical community in the UK. Their reputation for professional service is well established. With both sedation options you will feel more relaxed and less anxious during your appointment. We ask that a chaperone accompany you for your homeward journey. I found Ranju very friendly and helpful. I have had many dentists over the past sixty years but none were as informative in helping me to maintain my teeth as he has been. Top notch surgery and service.